BioInvasions Records is an open access, rapid peer-reviewed international journal of field research on biological invasions in aquatic and terrestrial ecosystems from around the world. 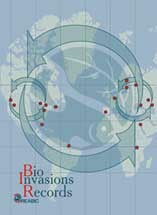 BioInvasions Records is devoted primarily to publication of research and data papers on records of non-native species. The journal provides the opportunity of timely publication of first records of aquatic and terrestrial invaders and other relevant information needed for online databases, decision support and early warning systems. BioInvasions Records is an official journal of International Association for Open Knowledge on Invasive Alien Species (INVASIVESNET). 2017 Journal Impact Factor: 1.189 (the Thomson Reuters Journal Citation Reports).